Roderick Morris studied music at Cambridge, then with Royal Academy Opera, and has travelled extensively to places such as South Korea, Japan, North America and Germany. 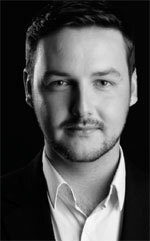 He has appeared as a soloist at Kings Place, St John’s Smith Square, on BBC Radio 3, and also performed a duet recital with Michael Chance in the Holywell music room in Oxford. His oratorio credits include the St Matthew Passion under Masaaki Suzuki, and David in Handel’s Saul at the Spittalfield’s Festival with Laurence Cummings. Operatically he has worked with companies including ENO and Iford, and his opera roles include Guido in Flavio, the title role in Cavalli’s Il Giasone, and Cupid in Venus and Adonis with La Nuova Musica.